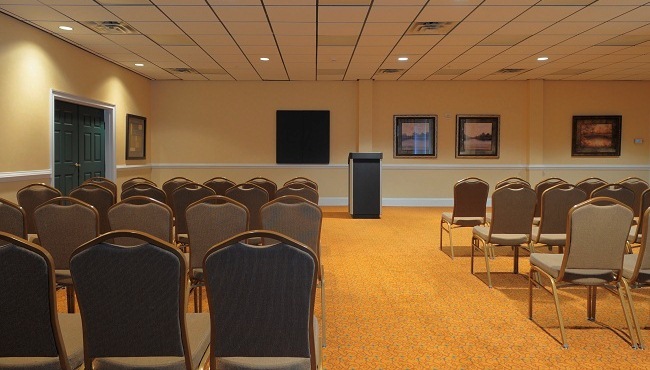 Capable of accommodating up to 80 guests, the meeting room at the Country Inn & Suites, Orangeburg can be arranged in a variety of configurations to meet your event needs. Take advantage of free high-speed Internet access and equipment like a television, a DVD player and a podium. The professional staff can help you arrange refreshments and find off-site catering services. Our hotel is also conveniently off I-26 so your guests can travel to local businesses or explore Orangeburg’s attractions. Traveling with a sports team? The Country Inn & Suites, Orangeburg is a Radisson Hotel Group Sports Approved hotel. To reserve the meeting space, a deposit of half the full cost (the rental rate plus any additional charges for food and beverages) must be paid seven days in advance. The remaining balance is due on the day of the event.